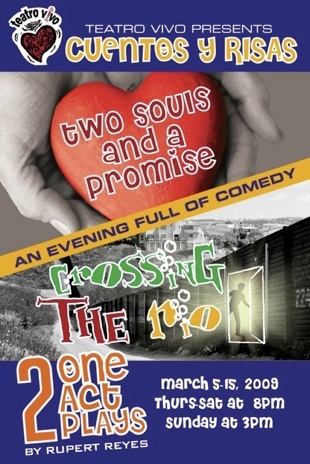 Teatro Vivo is proud to present Cuentos y Risas, an evening of comedy, with two bilingual one-act plays entitled 2 Souls and a Promise and Crossing the Rio written and directed by Rupert Reyes, Teatro Vivo’s artistic director. Rupert is the author of Vecinos, nominated for a B. Iden Payne award for best original script in 2008 and the very popular Petra plays, Petra’s Pecado, Petra’s Cuento and Petra’s Sueño. 2 Souls and a Promise is a bilingual comedy about two young lovers who make a promise to keep their souls united for eternity. What they didn’t take into account was that they were not destined to die at the same time, which brings interesting results. It’s a promise, una promisa, which comes true in a way that neither would have ever anticipated. Be careful about the promises you make, keeping them can be tricky! Crossing the Rio is a bilingual comedy about, a new officer in the Immigration and Customs Enforcement (ICE) branch of Homeland Security, Jarett Acosta, who is on probation for his job. To complicate things, his superior officer is actually his own over bearing father. Will he make his probation? His true test will not lie with how well he does his job but how well he doesn’t when the love of his life attempts to across the border illegally. Faced with this situation, will he have to cross his own personal river to save her? Teatro Vivo’s bilingual comedy offers a farcical look at a community facing a food shortage during a difficult economic time. Dario Fo’s No Se Paga! We Won’t Pay! takes a look into the lives of two couples struggling between good and starvation. When prices become too high for life’s necessities, who is to blame? Who is to suffer? And who is to take matters into their own hands? Antonia and Margarita are magicians at paying bills without money, cooking gourmet meals with pet food, and lying to their husbands. When the neighborhood supermarket begins to double their prices of food and the local factory is laying off 6,000 employees, the neighborhood panics, setting off a chain reaction of lies, mishaps, pregnant 80 year old women and a “miracle” by Santa Eulalia. 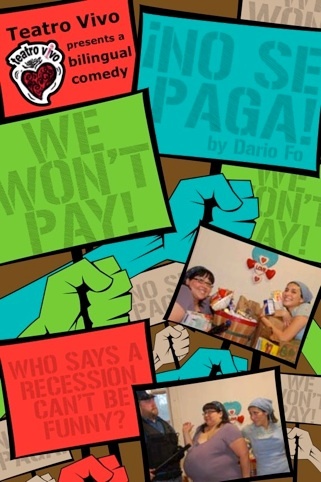 Teatro Vivo brings a unique style of bilingual (Spanish/English) production that couples comedy with social commentary in Fo’s ¡No Se Paga! We Won’t Pay! . The audience is challenged to think, how far would I go to continue to put food on my table? Can our economy become bad enough to ensue mayhem in supermarkets? Who said a recession couldn’t be funny? 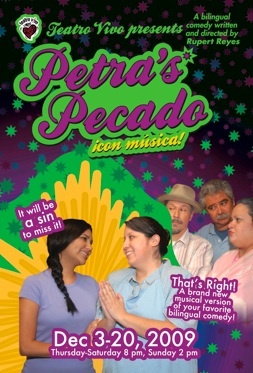 Teatro Vivo presents the return of the heart-warming bilingual comedy, Petra’s Pecado written and directed by Austin playwright Rupert Reyes. This year’s production, Petra’s Pecado con música, is an all-new updated musical version of Austin’s favorite bilingual comedy. 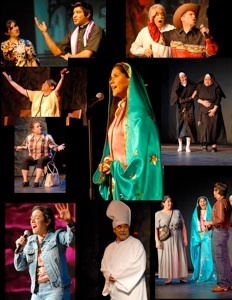 It will take nothing short of a miracle to help Petra and her senior citizen friends in the small town of Las Flores, TX, to present the annual play about the Virgen de Guadalupe at the local church. Why did the new priest want her to direct the play as penance for her sin? Was Petra’s sin that big? No one knows, not even her husband. What they do know is that Tina Tamayo, Petra’s tortilla business rival, is out for revenge and will do anything to stop the senior citizens in their tracks. Will Tina succeed or will Petra and her friends overcome their fears and save a lot more than the play? Left to Right: Erica Saenz, Matt Sadler, Karen Alvarado, Rick Olmos, Martinque Duchene-Phillips. Photo: Alberto Jimenez. This laugh out loud comedy is about a modern day Latino family balancing the fine line between staying in touch with la familia and just being nosy. Janet struggles with her husband, Albert, to get her “metiche” mother-in-law, Carolina, out of their house, so she can enjoy more of Albert’s attention. Meanwhile, younger brother, Jack, and his wife Melinda deal with the complications of supporting their new baby. To top it off, there is their childhood friend, Yolanda, who might as well be family, to deal with. 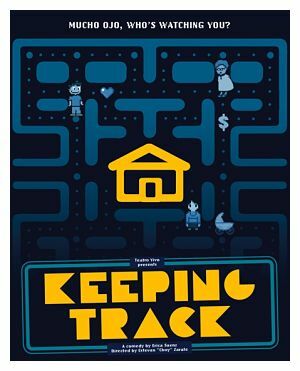 Everybody is about “keeping track” of what is going on with la familia. Surveillance monitors, implanted microchips and geriatric romances? ¡Ay yi yi! Mucho ojo! Who is watching you? You’ll find your self texting – AQF – for Ay que funny! Why you should go see "jj's arcade"